This week’s Restaurant of the Week is Lutyens, the latest venture from veteran London restaurateur Sir Terence Conran. David Burke, head chef at Lutyens, the latest restaurant project from Terence and Vicki Conran in partnership with Peter Prescott, has constructed a menu on foundations of simplicity. Burke and Conran go back a long way. When the Irish chef’s three-year stint at Bibendum ended in 1990, he went on to open Le Pont de la Tour, where he stayed for 10 years. This latest collaboration came about because Conran felt the City was crying out for a decent grill room. 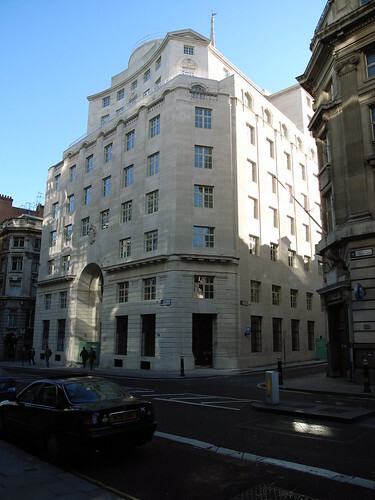 Lutyens restaurant honours British architect Sir Edwin Lutyens, who designed the grandiose former Reuters press agency building on Fleet Street in which it is housed. It comprises a 130-seat restaurant, a 50-cover bar, a members’ club and four private dining rooms. The food offering includes breakfast, rôtisserie, crustacea bar, charcuterie counter and à la carte, with a modest sushi offering in the pipeline. This week’s Restaurant of the Week is the Criterion on London’s Piccadilly. First opened in 1874 as the Long Bar or Marble Hall, the Criterion is a Grade II-listed building that forms part of the 120,000 sq ft Criterion Theatre block, which is owned by the Crown Estate. Its spectacular interiors include marbled floors and mirrored walls set below a magnificent neo-Byzantine golden mosaic ceiling. Marco Pierre White acquired the restaurant from Forte in 2001, when it was managed by My Kinda Town, successfully returning it to its former glory, but his love for the Criterion seemed to have waned over the years. In February this year, the restaurant was given a new lease of life after it was taken over by Irakly Sopromadze of the Vox Restaurant company, a 21-year-old entrepreneur from the former USSR state of Georgia. He acquired the Criterion as the first of a number of planned investments in the capital, “gently restoring” its interiors and bringing in new head chef Matthew Foxon. South African Foxon joined from acclaimed south London gastropub the Rosendale where he had been head chef for 18 months. He says he considers the opportunity to bring back the Criterion “like phoenix from the ashes” as a great honour. A set menu, priced £18 for two-, and £23 for three course, is available at lunch time as well as pre- and post-theatre and offers a choice of around five starters, mains and desserts. The à la carte meanwhile is divided into sections: soups, crustaceans, starters, main courses, grills, pasta, egg dishes, and desserts as well as a sushi and sashimi section to cater for the restaurant’s Russian clientele. This week’s Restaurant of the Week is the Pass at the Exclusive Hotels-owned South Lodge in West Sussex. The Pass is a new restaurant concept, I’ve not seen anywhere else before – the whole dining room is situated in the kitchen, offering customers views of the chefs’ live action. It’s an evolution very apt for our times, when foodie customers are just as hungry for the process and personality behind restaurant dishes as they are for the food itself. The concept of the Pass grew out of an idea for a chef’s table, and expanded to its current guise as the hotel incorporated the adventurous design into its refurbishment programme. The new restaurant is a gleaming hall of chrome and muted clattering, with a green leather banquette and facing stools wrapped round the edge of one corner allowing full views into the quiet hubbub of the chefs in the kitchen. The man in charge of the youthful four-strong brigade is Matt Gillan, a graduate of acclaimed kitchens including Gordon Ramsay’s three-Michelin-starred restaurant on Chelsea’s Royal Hospital Road, and the two-Michelin-starred Vineyard at Stockcross, where Gillan worked under John Campbell. This week’s Restaurant of the Week is the 2009 Catey Menu of the Year winner, the Harwood Arms in London’s Fulham. Good beer, a simple countryside-in-London atmosphere, and unfussy yet inventive British cuisine. This pretty much sums up the Harwood Arms, which launched last October as a joint venture between rural celebrity chef Mike Robinson, publican Edwin Vaux and Brett Graham, head chef at the Michelin-starred the Ledbury. The menu at the 60-cover gastropub is the brainchild of Graham and head chef Stephen Williams and it’s a menu of exclusively English produce. Its creativity is what stands the Harwood Arms apart from competitors and marks its appeal amidst a sea of so-called London gastropubs. And of course there’s the price point: à la carte starters rarely exceed £6, mains rarely £15. The key: everything is fastidiously seasonal and, beyond the protein, the luxuriousness of the dish is in the cooking alone. This week’s Restaurant of the Week is the Dorchester Grill in London. After a two-year accord with Aiden Byrne’s complex modern cuisine, the Dorchester Grill has returned to its roots with a more wholesome, comforting menu under the guidance of new head chef Brian Hughson. Moving across from a similar role at the Michelin-starred Rhodes W1 in London’s Cumberland Hotel after Byrne left to set up a gastropub in Cheshire last December, Hughson’s assumption of the reins at the Grill has, for personal reasons, been fairly low key these past six months. However, it has meant that he has been able to reshape the restaurant to a more traditional grill room offering away from the eyes of the media. Although the high prices of some dishes might deter prospective diners – on the grill menu, Dover sole is £42 and aged Welsh black rib-eye steak is £29 – there are certainly bargains to be had, such as the honey glazed ham with buttered cabbage, smoked sausage and parsley sauce at £36 for two people. In fact, one of the triumphs of the restaurant is a lunch menu that continues through to a reasonable hour of the evening. Diners happy to eat before 7.30pm – late for a pre-theatre menu – can enjoy two courses for £19.50 or three courses for a respectable £25. This week’s Restaurant of the Week is the Michelin-starred Latymer at country manor hotel Pennyhill Park in Bagshot, Surrey. Pennyhill Park is one of Surrey’s most remarkable hotels. Set in more than 120 acres of park lands, the Exclusive Hotels-owned property features its own golf course and impressive spa as well as 123 beautifully decorated rooms. Two restaurants provide sustenance to visitors: an informal brasserie serving comforting classics and the more formal Michelin-starred Latymer Restaurant, which bears the name of head chef Michael Wignall. Best known for his five-year stint as executive chef at the Devonshire Arms Hotel in Yorkshire, where he held a Michelin star for four years, Wignall joined Pennyhill Park at the end of 2007, stepping into the shoes of former executive chef Andrew Turner, who left to set up the Landau restaurant at London’s Langham hotel. The Latymer is a 50-seat dining with interiors featuring dark wooden wall panels alongside green banquettes and steamed glass screens separating tables. Wignall serves a set menu of three-courses at £58 as well as a ten-course tasting menu at £78. He describes his cooking style as “complex and carefully crafted”. “While the style is technical and the presentations elaborate, the food itself is not intimidating, having its roots in familiar classical themes,” he says. This week’s Restaurant of the Week is Corrigan’s Mayfair, run by the Michelin-starred Irish chef Richard Corrigan. The restaurant, which is located adjacent to the Grosvenor House hotel, opened last November in the site that once housed the iconic three-Michelin-starred Chez Nico at Ninety. Interiors are loosely based on a hunting lodge, a theme carried through by the menu which has a focus on wild foods and game at its core. Crustacean and seafood play a central role at Corrigan’s and the menu kicks off with native oysters and dishes including Cornish crab jelly with melba toast, octopus carpaccio and Corrigan’s take on a bouillabaisse, a South Coast fish soup served with garlic mayonnaise. Main courses are divided into meat and game, and fish sections, with the latter featuring dishes including butter poached smoked haddock with lobster and creamed parsnip; and steamed sole filet with ceps served in cooking juices. Coincidentally after featuring Aubergine at the Compleat Angler as my Restaurant of the Week last week, I have just learnt that head chef William Drabble has left. Drabble, who took over the reins at Aubergine from Gordon Ramsay, has spent more than a decade behind the stove at the Chelsea restaurant. During this time he retained its Michelin star and successfully launched a sister restaurant in Marlow last autumn. But all good things must come to an end and Drabble has decided that the time has come for him to pursue other opportunities. His departure coincides with that of the London Fine Dining Group’s marketing and operations director David Herbert. Look out for further details on Caterersearch. Just got a statement from the London Fine Dining Group confirming both Drabble and Herbert’s departure. Both are under a confidentiality agreement so unable to share their reasons for leaving. “David left the group to pursue other business opportunities pursuant to the terms of a confidential settlement agreement,” it said. This week’s Restaurant of the Week is Aubergine at the Compleat Angler in Marlow, Buckinghamshire. After a decade behind the stove at the Michelin-starred Aubergine in Chelsea, which was once home to a young Gordon Ramsay, head chef William Drabble exported his culinary skills to a sister restaurant in Buckinghamshire last autumn. The launch of the restaurant at the Macdonald Hotels-owned property in Marlow marks the London Fine Dining Group’s first venture outside of London. Headed up by Drabble’s former sous chef, Miles Nixon, the simple French cuisine applied to high-end produce that marks his cooking is replicated in Marlow but with £10 shaved off the menus. However, the different price point doesn’t dilute the preference for luxury, and Aubergine’s seven-course tasting menu is a masterclass in bringing the best out of well sourced top-end produce. Typical dishes may include lobster tortellini with cauliflower purée and truffle butter sauce; or seared foie gras with marinated figs.